The New Hope Arts Center Outdoor Sculpture Project is a free and accessible public art display creating an artistic gateway into the Borough of New Hope, PA. The Sculpture Project is an exhibition of contemporary work by regional and national artists. Begun by New Hope Arts, Inc. in 2003, our partnership with The PNC Foundation from June 2015 to December 2016 with a The PNC Arts Alive grant provided the funding to expand the program. Today the Project continues its sculpture mission with the support of private donors and sponsors. This walk-able family-friendly public art display is explored and enjoyed by residents and visitors alike. Be part of ART! Download our sculpture map and visit New Hope Sculpture! Site selection, preparation, installation and maintenance is administered by New Hope Arts. Hope by Peter Dellert is hosted by The Borough of New Hope near the offices and the community building near New Street. New Hope Arts connects sculptors and hosts in its unique and time-honored program. You or your business can participate in the exciting collaboration of public art, enjoyed by the community and visitors to the region. We collaborate with sponsors on finding an art work that appeals. Our newest newest addition to New Hope's Outdoor Sculpture Project is Golden Oak Leaf Arch by Jim Gallucci. This piece can be found at Rabbit Run Creek, adjacent to Route 202 and The Solebury Walking Path in New Hope, PA.
Jim Gallucci, a resident of North Carolina, has been a participant in the New Hope Arts Outdoor Sculpture Project since its beginning. His Listening Bench was added in 2015 and currently owned by The Bucks County Children's Museum. Michael Pascucci's Egos, is the newest installation in New Hope's Outdoor Sculpture Project. You can find it just across the street from Boomer (one of our first installations back in 2003) at the River Cat Cafe on South Main Street, New Hope. The Sculpture Project now features over 16 contemporary works by regional and national artists. New Hope Arts' outdoor exhibition continues with the support and partnership of patrons who have sustained and maintained this walk-able family-friendly public art display for over 15 years. More than 80 works have been exhibited on a rotating basis throughout the Borough of New Hope. 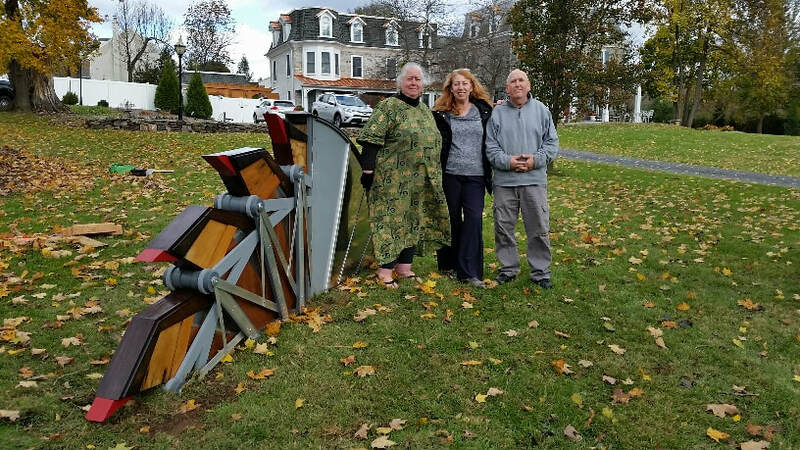 The most recent addition to New Hope's Outdoor Sculpture Project is Stephen Klema's Hobbes' Claw III, hosted by Fox & Hound Inn, 246 W. Bridge Street, New Hope. Innkeeper, Lisa Menz, collaborated with sponsor, Pamm Kerr and installation specialist, Harry Gordon to add the work to New Hope's ongoing, accessible and free outdoor sculpture exhibition. The Sculpture Project currently features over 15 contemporary works by regional and national artists. Begun in 2003, New Hope Arts' outdoor exhibition continues with the support and partnership of patrons who sustain and maintain this walk-able family-friendly public art display. Over its 15 year history more than 80 works have been exhibited on a rotating basis throughout the Borough of New Hope. Stephen Klema, a connecticut artist, was introduced to the region in New Hope Arts' Design Competition in January 2016, funded by the PNC Arts Alive grant from The PNC Foundation in Philadelphia. This year two additions are scheduled. New Hope Arts' Outdoor Sculpture Project installed Tonka, a massive basalt art work by sculptor Harry Gordon. Host, Solebury Parks & Recreation in Magill Hill Park in Solebury. Our Facebook page will keep you up-to-date on status of our photo contest, new sculpture installations and other Outdoor Sculpture events.